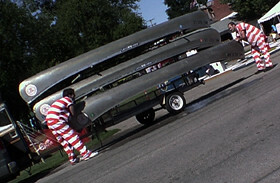 A couple years ago I went to the River Fest in Mendon, MI. They had canoe races, games, concession stands and this excellent Avant Garde clown troupe. I asked one of them to make me a balloon animal... instead he crafted me a balloon noose. Funny clown.